More than 170 strips that NO ONE has seen. No, not even YOU, Mister/Ms. UNR alum! 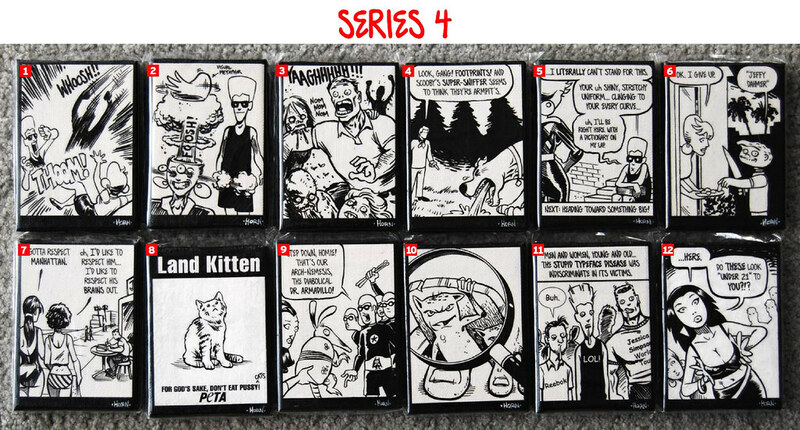 Darlene’s second comic — she wrote it, I drew it, we both lived it. If you eat food, then this is for YOU! Shall we sign it for you? No, thanks. I’m gonna resell it on eBay. 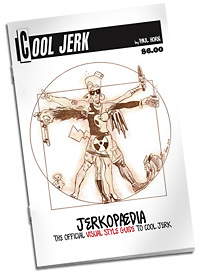 The Official Visual Style Guide to Cool Jerk! High-sterical character model sheets for everyone from Armpit and Puppy to Durk and Dog-Shoggoth the Cthulhudoodle! Shall I sign it for you? With a lil’ sketch too, I hope! 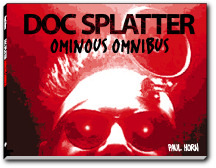 Would you like the book personalized to you? Would you like The Doc to personalize it to you? Be sure to click the red DETAIL links so you can see your choices! 4: Do these look under 21? 1: Are you calling us liar?? 4: Dangerman SMASH Comic Sans! 12: Afraid of the twins? 12: Do these look under 21? Special 20th Anniversary shirt features roughly 60 Cool Jerk characters! Mr. Pinkle! Dr. Armadillo! The New Lou! Arms Over Head Guy! Zombie head! Thundercougar! Java the Hut! 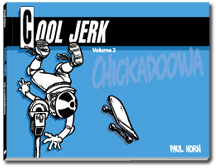 Find other odd & ends, like mugs, mousepads, trucker hats, undiepants and more varieties of shirts at the Official Cool Jerk Cafe Press store. Afraid of the InterWebs? 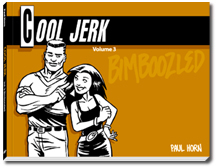 You can find Cool Jerk books at these fine brick & mortar retailers!